Making the switch to wildgame innovations in trail cameras with one of its earliest products on the line, the Wild Game Innovations Buck Commander Nano 10 offers solid image capturing performance in a compact frame. This remarkable product is designed to be one of the finest trail cameras on the market with its host of revolutionary features that should make every hunting trip productive and truly one for the books. Made weather-tough for superior outdoor use, the Nano 10 is designed to withstand the elements so it can be used for many hunting seasons to come. Engineered to be water resistant, this camera can be positioned in the wilderness and can be left there to capture images even in the rain. Capturing images all season long, this trail cam can be left hanging outside so you can get accurate monitoring of your prey’s behavior, from the early season to the rut to the late season so you’ll be able to track just how the deer are doing at specific times of the day on specific parts of the hunting season. With this technologically-advanced ultra-rugged piece of equipment, you won’t have to worry about the investment you make since the trail cam is made to improve your hunting experience thanks to its impressively solid construction. After all, Wild Game Innovations is a company built by avid deer and wild game hunters who are well aware that getting good images is one of the keys to making trophy catches. This wireless 10MP micro digital trail camera is outfitted with 36 pieces of high intensity LEDs carrying the revolutionary ‘Lightsout’ feature, an undetectable invisible flash that ensures optimal exposure control so images are ultra clear and bright when reviewed. Providing reduced motion blur, the camera boasts infrared technology to detect true motion and avoid false positives that can come from a combination of the surrounding conditions. This means you can view images in detail and with less ghosting effects that come from rapid movement transitions. The Nano 10 comes with a rapid one-second trigger speed, which is far from being lethargic so there is just a second that elapses between when the unit first detects the motion and until it takes a photo of what caused the movement. The trigger speed is one of the most important aspects of any trail camera, as it guarantees that you won’t get wasted photos on no animal at all or on only half of an animal. Thanks to its exceptional TRUbark™ high-def texture with swirl camo finish, the Nano 10 will be undetectable to wild game and other hunters. 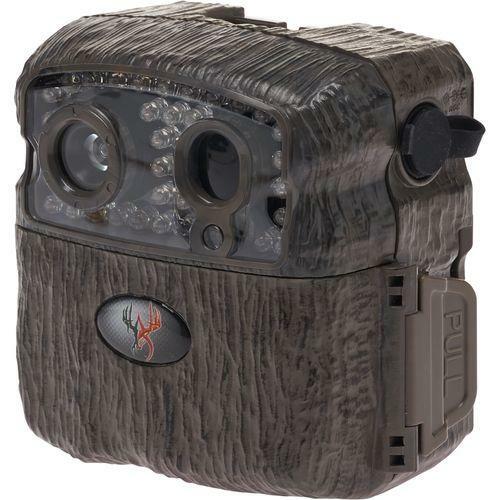 Its impressive tree bark finish renders the trail cam invisible to your prey, enabling it to do its job effectively. The unique finish also makes the camera theft proof, as it easily blends into the tree you hang it on so it will not make an easy target for vandals and nasty people. The Nano 10 easily fits in the palm of your hand, so it won’t weigh you down. The compact design makes it easy to pack along with your other hunting setup gear so you can easily fit several pieces of the trail cam in your backpack as you go around your property to set everything up during the pre-season prep you have to do. It has an external battery port that enables easy portability and effortless charging so you can juice up rechargeable batteries separate from the camera unit. The trail cam runs on 4 double-A batteries, which are quite easy to find in the stores. This means no searching for special fuel cells just to get the unit going. This trail camera has an 80-foot flash range, which denotes the maximum distance it can project its flash and illuminate the wild game for adequate identification. It can effectively identify game based on the same atmospheric conditions and on the same night to prevent variations in captured images. In addition, the trail camera also has Flextime and time lapse technology so it can capture images at regular intervals. This means the unit can take photos at preset intervals to enable you to study the deer’s behavior patterns at different points of the day such as at dawn and dusk. Furthermore, the camera also offers both high-definition 720p video and photo capabilities so you get both live trigger images and photos from just a single trail camera. The camera accommodates up to 32GB SD/SDHC cards for impressive storage capacity. The USB cord offers flexible charging options. The bungee cords let you attach the unit to a tree of your choice for hanging on the deer trail.